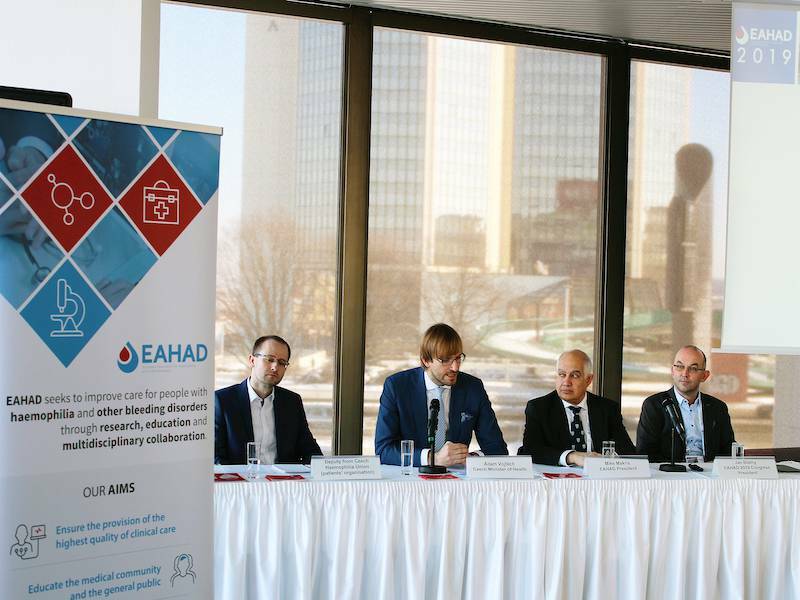 On February 5, 2019, the day before opening the 12th congress of the European Association of Haemophilia and Allied Disorders (EAHAD), a press conference was held under auspices of the Czech minister of health, Adam Vojtěch. EAHAD chose Prague as its 12th congress destination and more than 2,600 medical experts, pharmacists and community representatives from 80 countries from around the world came to Prague. In the history of the congress this was a record-breaking number and the PCC got a great chance to present itself as an experienced convention centre. At the press conference, Professor Mike Makris, the President of the association, underlined that Europe is leading the world in research on rare diseases. Czech minister of health, Adam Vojtěch, and the President of the EAHAD 2019 Congress, Jan Blatný, expressed his pleasure from hosting the congress in Prague. "I consider this to be sort of a recognition of the Czech Republic and the cooperation of its specialists - physicians, nurses, physiotherapists, insurance companies – all, who take care of patients with bleeding disorders. No country where the care wouldn’t be at a high level would become the host of such a congress," said Mr. Blatný for the PCC. He also added that the care system in the Czech Republic is provided through a sophisticated network of specialized centres. A record number of EAHAD congress participants was brought to Prague not only thanks to the attractiveness of the city, but also due to advances in genetic therapy, which keep publishing promising results making an opportunity for a quality discussion during the congress. The President of the association, Mr. Makris, praised the beautiful view from the foyer of the Prague Congress Centre, where an exhibition of scientific posters was held, and delegates were networking over tasty products made from the local cuisine of Zátiší Catering using 70% of bio degradable dinnerware. The main program of the congress took place February 6 – 8, 2019 in 13 halls and meeting rooms, where also discrete sessions with specialists were held separately. These roundtable discussions were hosted by renowned conference partners. The Prague Congress Centre appreciates the given confidence and positive feedback of the organizers in organizing this socially significant congress.